Aubie doesn’t speak—we know this. But could he be compelled to testify? Legal eagles have wrestled with the question for years; if they had only emptied their lives of anything better to do than than peruse old issues of the Plainsman, they’d already know the answer: Yes—kind of. In November 1979, Auburn’s mute mascot was (kind of) called as a witness in the City of Auburn vs. The Old Man, aka Jimmy Smothers. Smothers, an Auburn student, made the up-to-one-year-in-prison mistake of wearing an “old man mask” for Halloween the day before Halloween. He drove down College Street. A cop saw him. The cop arrested him. Since he wasn’t robbing a bank or burning a cross, Smothers’ attorney Nancy Davis argued that the arrest violated the spirit of the law, which was designed to curb Klan activity back in the day. Do you arrest Kris Kringles come Christmas time? More importantly, do you arrest Aubie come game time? “Nancy’s theory was if we are going to do that, we might as well arrest the guy who is Aubie and regularly wears a mask,” said Barry Mask, the first Auburn student to officially don Aubie’s sacred stripes. Mask is currently an Alabama state representative from Wetumpka. 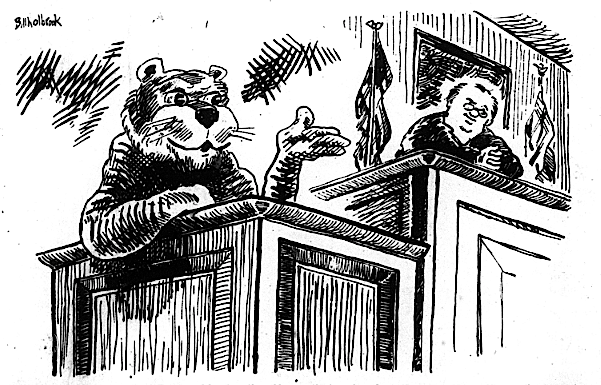 The Plainsman’s story on the case (“Aubie plays star witness at trial”), which Davis, who still practices law in Auburn, has framed and hanging in her office, featured a comic drawn by Plainsman cartoonist extraordinaire Bill Hollbrook that suggests Mask was actually in costume on the witness stand. He wasn’t. Mask even testified that once while driving and dressed as Aubie he pulled up next to a police car at a stoplight. The policeman smiled and waved. According The Plainsman, the judge said that while Smothers was “technically guilty,” the arresting officer should have used better judgement under the celebratory circumstances. In his defense, it could have been the certain “old man mask” that was making the rounds on campus that year. He may have thought he was doing us all a favor. Wow, I’d forgotten drawing that. Wait, is this law still on the books? Do i need an attorney? What’s this about people dressing up like Aubie? You mean, like, imposters? One would almost think you’re saying that Aubie is not a real tiger, but that’s CRAZY. I so remember this! Bill, even Auburn attorneys hang your work in their offices!